During his time in Congress, Rep. Massie has been the foremost champion of the effort to audit the Federal Reserve. Just this week, he re-introduced the bipartisan Federal Reserve Transparency Act, H.R. 24, which would accomplish that. Thanks to his work, the White House has begun to express sympathy with his view that we need more transparency at an organization that controls so much power over the U.S. economy. Rep. Massie has also demonstrated he is unafraid to take on important fights, even if they make him unpopular amongst his colleagues. After GOP leadership shamefully used the rules for Farm Bill debate to bar an unrelated resolution on war powers in Yemen from coming to the floor, Rep. Massie could not stay silent. He used the ensuing days to demand roll call votes on measures that would ordinarily go through without one. He also made sure leadership was unable to flout rules they normally ignore to rush legislation through. We need more adamant defenders of good process in Congress, and we hope Rep. Massie’s efforts inspire new members to join that fight. He has also fought against big government surveillance programs with a bipartisan group of legislators to protect the civil liberties of all Americans. He was one of the co-sponsors of the USA RIGHTS Act, which would have promoted transparency and accountability over domestic surveillance programs. With Section 215 of the Foreign Intelligence Surveillance Act set to need re-authorization at the end of this year, Rep. Massie’s leadership will again be crucial. Rep. Massie is the owner of a lifetime 96 percent score on the FreedomWorks congressional scorecard. He has earned a FreedomFighter award in each of his six years in Congress. FreedomFighter awards recognize members who consistently vote to uphold the free market and personal freedom. As he has demonstrated in his votes and in his initiatives while in Congress, Rep. Massie can be counted on as a champion for the limited government principles central to constitutional conservatism. 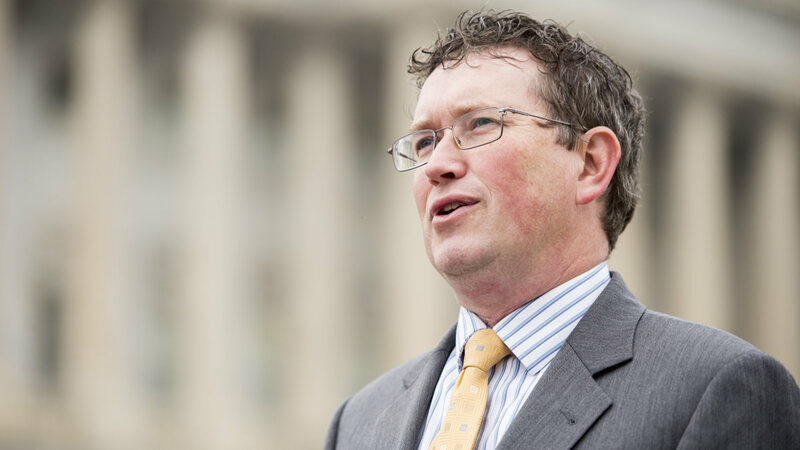 FreedomWorks is proud to feature Rep. Thomas Massie (R-Ky.) as January’s member of the month, to recognize and honor those who defend our liberties in Washington every day. Largest shopping website gives you amazing offers or discount, visit https://cashwapas.com/retailer/paytm or get paytm cashback for your shopping or get more offers also get cash back. "There is no entity in the world that controls our lives more than the Federal Reserve System" - Harry Reid, 1995. While Harry Reid admits the unchecked power of the Federal Reserve, he has failed to act to provide oversight of the central bank. Despite the concentrated power of the Federal Reserve, it has little accountability from Congress or any branch of government. Senator Rand Paul has reintroduced legislation to audit the Federal Reserve in the Senate. The bill, S. 209, currently has 24 cosponsors. This legislation is important because the people deserve to know who the Federal Reserve is bailing out behind closed doors. Here are the Republicans that have not cosponsored the audit the Fed bill yet. Please call them or tweet at them and politely ask them to cosponsor S. 209! This past Saturday, September 22, marked the fourth annual End the Fed day. At Federal Reserve branches across the country, liberty activists showed up to call attention to the corruption and immorality of the Federal Reserve System. Senator Rand Paul (R-KY) has introduced the Federal Reserve Transparency Act (S.202)—commonly called the Audit the Fed bill—in the Senate. As of today (9/20), the bill has 34 cosponsors.UPDATE: 37 COSPONSORS AS OF 11/14.Find out if your senators are cosponsors here. FreedomWorks is proud to report that the 2012 GOP Platform, as approved at the 2012 Republican National Convention in Tampa, Florida, incorporates almost all key elements of the FreedomWorks “Freedom Platform”. Most notably, the 2012 GOP Platform calls for both an Audit of the Federal Reserve and the full repeal of Obamacare, two of the cornerstones of the Freedom Platform. Striking similarities between the two platforms are an encouraging reminder of the ground that the freedom movement is gaining within the establishment Republican Party. With Ron Paul’s Federal Reserve Transparency Act overwhelmingly passing the House last week, the fight moves on to the Senate. Senator Rand Paul (R-KY) has introduced an identical bill, S. 202, in the Senate. According to the Library of Congress’ THOMAS website, the legislation currently has 23 (edit: now 27) cosponsors. Great news: Ron Paul's Audit the Fed bill passed the House! But this is where the hard work really begins. Senator Rand Paul (R-KY) has introduced a bill identical to H.R. 459 in the Senate. It's S. 202, the Federal Reserve Transparency Act of 2011. Senator Harry Reid (D-NV) vows not to put Audit the Fed to a vote in the Senate. AUDIT THE FED VOTE TODAY! CALL CONGRESS NOW! As my FreedomWorks colleague Julie Borowski reported last week, the House is scheduled to vote on Congressman Ron Paul's "Audit the Fed" bill, H.R. 459, TODAY. Help us put it over the top! We've already placed 1,500 calls to Congress. Help us place at least 500 more calls before the House vote, which we expect to take place around 1:15 PM ET TODAY.